Part of Galco's new Concealed Carry Lite® line of holsters, the WalkAbout® offers all the benefits of the Stow-n-Go with the addition of an attached magazine carrier. It's an exceptional combination of high performance, comfort and affordability. The WalkAbout's open top allows a very fast draw, while the reinforced mouth allows a smooth and easy return of the gun to the holster. A sturdy injection-molded nylon clip secures the holster onto the belt. The WalkAbout inside the pants holster carries the handgun in a vertical orientation, with no cant or angle. It can be used strong side, or in front of the hip (appendix carry). Constructed of comfortable premium Center Cut Steerhide®, the WalkAbout fits belts up to 1 3/4". This is really a great holster extra mag pouch. 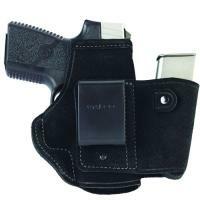 Its very comfortable and very concealable, and the price really makes it worth the value. I am completely satisfied. Extremely comfortable and conceales well. Glock 19 and spare mag. Love the belt clip to. Very nice fits like a glove. Love it so far. Appendix carry glock 27 keeps the handle just above my beltline. I did modify the magazine pouch so I can carry a 16 round mag while not sticking out past the gun. Figure if I'm grabbing my 2nd mag I want full capacity. This holster is perfect for my glock 42. A little bigger than I thought it was going to be but still manages to conceal with little printing. After wearing my new holster and doing her own test (burpees, jumping Jacks, and a few sprints), my wife seemed satisfied enough that she decided to buy one for herself. Great holster for my Glock 26 Very comfortable. Good quality holster. Very satisfied with it. I love this holster for my Glock 42, it is very comfortable, I am waiting for galco to make one for the glock43, I also love it because of the magazine pouch. Great gift for our newly appointed Port Authority patrolman grandson.